Egypt and South Africa are the countries bidding to replace Cameroon as host of next year's African Cup of Nations and the winner will have just five months to put preparations in place for the continent's top soccer tournament. CAF announced the bids late Saturday — the deadline to submit was end of Friday — and said that its executive committee will decide the new host at a meeting in Dakar, Senegal on Jan. 9. That date, which was pushed back from Dec. 31, gives the host precious little time to get ready for a tournament which is scheduled to kick off June 15 and is the first to be increased from 16 to 24 teams. Cameroon was stripped of hosting rights last month because of delays with its preparations and a violent separatist movement close to two tournament host cities in the western part of the country. Although Egypt and South Africa have the best soccer infrastructure in Africa, organizing at such short-notice still promises to be a challenge. The African soccer body also needs to decide if South Africa, should its bid win, would automatically qualify as the new host. The South African team still hasn't qualified and plays its last qualifier in March. Egypt has qualified. CAF also hasn't said if Cameroon, the defending African champion, will retain its place at the tournament as the original host. African Cup hosting has been a major headache for CAF, with four successive tournaments now switched from their initial host countries. South Africa hosted in 2013 when it replaced war-torn Libya, Equatorial Guinea stood in for Morocco in 2015, and Gabon replaced Libya again last year. The Cup of Nations is played every two years, not every four like other major tournaments. The bids by Egypt and South Africa came after Morocco, long considered the front-runner to replace Cameroon, surprisingly said last week it wouldn't put itself forward. Morocco had been widely touted as a replacement after it was a candidate to host the 2026 World Cup. It lost out for the World Cup to a joint United States-Mexico-Canada bid. Egypt said as recently as last month that it would not enter the race and compete with the expected bid from fellow North African nation Morocco. Morocco's decision not to bid appears to have led to Egypt's change of heart. Egypt is a powerhouse of African soccer, with its national team a record seven-time Cup of Nations winner. 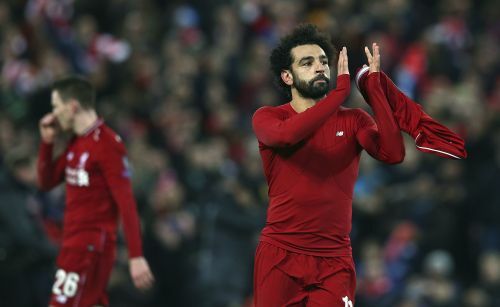 An African Cup in Egypt would also provide an intriguing story-line for Mohamed Salah, the Egypt forward who is currently the continent's best player and a hero in his home country. But Egypt's recent political turmoil might work against the country's bid. Egypt has seen violence and upheaval ever since the 2011 uprising against former president Hosni Mubarak. The political crisis also regularly spilled over onto the soccer field and the lowest point came when more than 70 people were killed in a riot at a game in the northern city of Port Said in 2012. It was one of world soccer's worst stadium riots. Port Said was floated as one of the proposed 2019 tournament venues by Egyptian officials, alongside another Mediterranean city, Alexandria, Suez and the capital Cairo. Egypt's bid does have logistical advantages for CAF, though, with the African soccer body based in Cairo. South Africa hosted the continent's first World Cup in 2010 and has world-class stadiums left over from that tournament. The South African Football Association said it had been approached by CAF in recent weeks to bid for 2019, suggesting Africa's most developed economy is the preferred choice for organizers. But the South African Football Association was still seeking permission from government to bid on the day of the deadline on Friday and it's unclear how much money the country is willing to commit having spent big on soccer tournaments in recent years. CAF also has problems with future editions of its showpiece event, with African soccer president Ahmad saying in a media interview it had offered the 2021 edition to Cameroon. That provoked an angry response and a legal challenge from Ivory Coast, which was initially awarded the tournament and says it still considers itself the host. CAF, under former president Issa Hayatou of Cameroon, awarded hosting rights for three tournaments at the same meeting in 2014 — Cameroon in 2019, Ivory Coast in 2021 and Guinea in 2023. Questions were immediately raised over all those countries' ability to hold the tournament. Outside of a few exceptions, most African countries are not prepared to host a major soccer tournament and the African Cup often gets by on last-minute preparations and the most basic infrastructure. Tomorrow NOT AFC 05:30 PM Notts County Res. vs AFC Bournemouth Res.